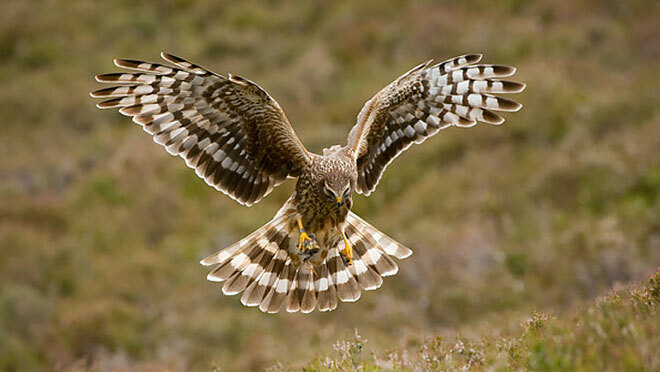 « Four more satellite-tagged hen harriers ‘disappear’ on Scottish grouse moors. Female hen harrier Mabel was one of four chicks that fledged in July 2018 from a nest site in the Cumbrian area of the Yorkshire Dales National Park. Along with her sibling Tom, she was fitted with a satellite tag on 10 July by Natural England. Sergeant Stuart Grainger, of North Yorkshire Police’s Rural Taskforce, said: “I was lucky enough to spend some time monitoring Mabel’s nest site, and, despite following birds all my life, this was the very first time I’d ever seen a male or female hen harrier because they are so rare. Landowner farmer Andrew Brown said: “It was a pleasant surprise when Natural England staff knocked on my door and let me know these rare birds were likely to breed on my land. “The experience of watching them throughout the spring and early summer from building their nest to fledging four chicks was a real privilege. David Butterworth, Chief Executive of the Yorkshire Dales National Park Authority, said: “There was delight from all right minded people when four hen harrier chicks fledged earlier this year in the National Park. That has been matched by the despair felt that one of the birds, Mabel, has now gone missing. Anyone with any information about the hen harrier’s disappearance should contact North Yorkshire Police on 101. Alternatively, speak to the RSPB in confidence, by calling the Raptor Crime Hotline on 0300 999 0101. 3 comments to It appears they are trying their best to kill every Hen Harrier they come across. Yet a fifth Hen Harrier reported missing near a grouse moor 2 October. I’m not suggesting for one minute that persecution of some hen harriers does not happen. However surely this is only one piece of the young harriers very difficult survival jigsaw? It is well known that around 2 out of 3 harriers will perish of natural causes in their first year of life. Add on top of this the added burdens and weight of a satellite tag, harness and a bloody great aerial sticking out the back of each of these young harriers. Surely these magnificent raptors have evolved over millions of years to be both light and aerodynamic for hunting and to avoid other larger aerial raptors? These large aerials will surely allow the likes of Golden Eagles and Goshawk to home in and focus their aerial attacks on these young harriers? Once predated the aerial and satellite tag would obviously be ripped of and future satellite transmissions would obviously be lost. I’d like to ask readers a very important question. Are these satellite tagging technique doing the young harriers more harm and actually causing even lower natural survival rates? Were that to be the case that birds are incumbered by the tags that would have been obvious years ago. What you cannot explain is when a bird dies a natural death away from grouse moors both it and the tag are nearly always recovered yet on grouse moors both functional tag and bird just disappear indicating anything but a natural death. It has absolutely nothing to do with the natural mortality levels expected in young harriers. You are just a bloody apologist for the damned keepers. I have no direct answer to that but I sincerely doubt it. Satellite tags are fixed to many birds now, check out the BTO website for cuckoos. https://www.bto.org/science/migration/tracking-studies/cuckoo-tracking which has been going for many years now. Cuckoos are much smaller than Hen Harriers and yet these birds have been tracked to and from Africa for years. There have been some casualties mainly due to harsh Sahara weather, drought, etc., but this is a small %. I invite you to compare that casualty rate spread over the whole migration route with the horrendous almost 90% rate of lost harriers. I think you will find the answer, like Political power, comes out of the barrel of a gun.